The British Gov. is preparing to issue a statement only if there is an immediate end to the hunger strike. The Prime Minister met your Secretary of State at 0015 this morning to discuss the latest developments in the efforts to bring the hunger strike in the Maze to an end. Philip Woodfield was also present. Your Secretary of State said that the message which the Prime Minister had approved the previous evening had been communicated to the PIRA. Their response indicated that they did not regard it as satisfactory and that they wanted a good deal more. That appeared to mark the end of the development, and we had made this clear to the PIRA during the afternoon. This had produced a very rapid reaction which suggested that it was not the content of the message which they had objected to but only its tone. The question now for decision was whether we should respond on our side. He had concluded that we should communicate with the PIRA over night a draft statement enlarging upon the substance of the previous evening but in no way whatever departing from its substance. If the PIRA accepted the draft statement and ordered the hunger strikers to end their protest the statement would be issued immediately. If they did not, this statement would not be put out but instead an alternative statement reiterating the Government’s position as he had set it out in his statement of 30 June and responding to the discussions with the Irish Commission for Justice and Peace would be issued. If there was any leak about the process of communication with the PIRA, his office would deny it. NAME REDACTED said it was thought that the revised statement based upon the previous night’s message would be enough to get the PIRA to instruct the prisoners to call off the hunger strike. He then outlined the procedures that would be followed, if the PIRA said that they would call off the hunger strike. The meeting then considered the revised draft statement which was to be communicated to the PIRA. A number of amendments were made, primarily with a view to removing any suggestion at all the Government was in a negotiation. A copy of the agreed version of the statement is attached. The Prime Minister, summing up the discussion, said that the statement should now be communicated to the PIRA as your Secretary of State proposed. If it did not produce a response leading to the end of the hunger strike, Mr Atkins should issue at once a statement reaffirming the Government’s existing position as he had set out on 30 June. 1.In light of the recent discussions which Mr Michael Alison has had recently with the Irish Commission for Justice and Peace, during which a statement was issued on 4 July on behalf of the protesting prisoners in the Maze Prison, HMG have come to the following conclusions. IV. Ensure that a substantial part of the work will consist of domestic tasks inside and outside the wings necessary for servicing of the prison (such as cleaning and in the laundries and kitchens), constructive work, e.g. on building projects or making toys for charitable bodies, and study for Open University or other courses. The prison authorities will be responsible for supervision. The aim of the authorities will be that prisoners should do the kinds of work for which they are suited, but this will not always be possible and the authorities will retain responsibility for decisions about allocation. 3. Little advance is possible on association. It will be permitted within each wing, under supervision of the prison staff. 4. Protesting prisoners have been segregated from the rest. Other prisoners are not segregated by religious or any other affiliation. If there were no protest the only reason for segregating some prisoners from others would be the judgment of the prison authorities, not the prisoners, that this was the best way to avoid trouble between groups. 5. This statement is not a negotiating position. But it is further evidence of the Government’s desire to maintain and where possible to improve a humanitarian regime in the prisons. The Government earnestly hopes that the hunger strikers and the other protesters will cease their protest. 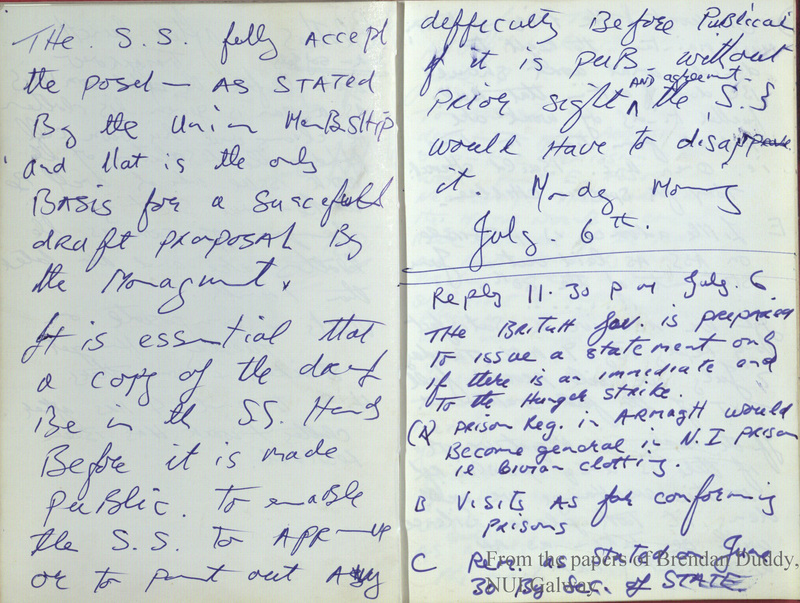 MIPT contains the text of a statement which SOSNI [Editorial addition: Secretary of State for Northern Ireland, Humphrey Atkins: STATEMENT ABOVE] proposes to authorise should be released to the hunger-strikers/prisoners and publicly. The statement contains, except on clothing, nothing of substance which has not been said publicly, and the point on clothing was made privately to the provos on 5 July. The purpose of the statement is simply to give precise clarification to formulae which already exist. It also takes count of advice given to us over the last 12 hours on the kind of language which (while not a variance with any of our previous public statements) might make the statement acceptable to the provos. The statement has now been read and we await provo reactions (we would be willing to allow them a sight of the document just before it is given to the prisoners and released to the press). It has been made clear (as the draft itself states) that it is not a basis for negotiation.